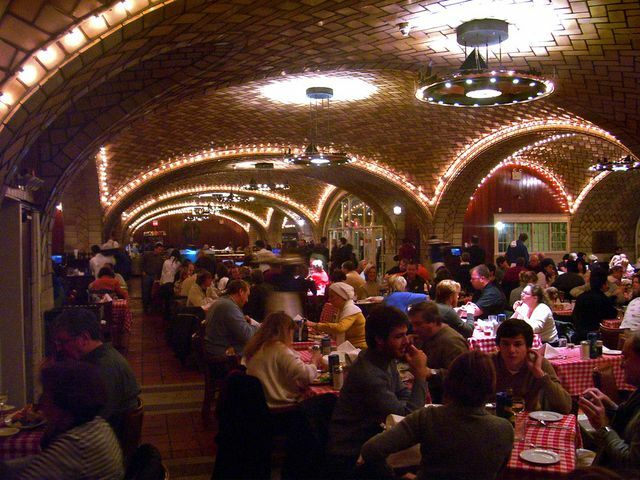 If I ever get to Heaven (which seems increasingly unlikely), I suspect it will look a lot like the Grand Central Oyster Bar. There will be a raw bar with people shucking more than a dozen varieties of bivalves. Dozens of varieties of fresh fish will be available daily from all parts of the country. There will be a formal dining room, a saloon, and a series of counters facing an open kitchen, all housed in a building of incomparable beauty. The Oyster Bar originally opened in 1913, and thrived along with the railroads. By the early 1970s, though, rail travel in America was almost extinct, and the Oyster Bar had died along with it. It was brought back to life by a veteran restaurateur named Jerome Brody, who redefined the concept and sourced the freshest possible seafood from a nationwide network of suppliers. It is again booming today, and has spawned an elaborate, upscale food court on Grand Central Station’s lower level. It is a huge place in its current incarnation, with seating for nearly 450 in its assorted venues. Those counters are unquestionably the heart of the place, each holding 14 diners and offering a quintessential American dining experience. You sit at one and confront the impossibility of choosing something from the encyclopedic menu. Can’t decide between New England and Manhattan clam chowder? They’ll give you half and half in the same bowl, and both are better than anything you may have tried previously. There are lobsters from Maine, soft shell crabs from Maryland, cold water halibut and better tuna than you find in most sushi bars. You could easily eat here every night for a month and not order the same dish. Service is precise and intuitive. You will not necessarily leave knowing your server’s name or life story. 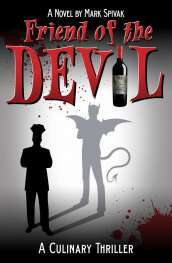 They are friendly if you want to be and will converse on demand, but that’s not their primary mission. They specialize in the old-fashioned technique of serving you without fanfare and without calling attention to themselves. The wine list is printed on the back of the food menu, and it is surprising: over 300 selections are offered from the U.S., France, Italy and Germany as well as emerging regions such as Portugal and Greece. You would expect whites to outnumber reds in a place like this, but the balance is closer to 50/50. Sure, you can get Sancerre, white Burgundy or California Chardonnay, but there’s also a vertical selection of Shafer Hillside Cabernet alongside Pinot Noir from Oregon, California and Burgundy. 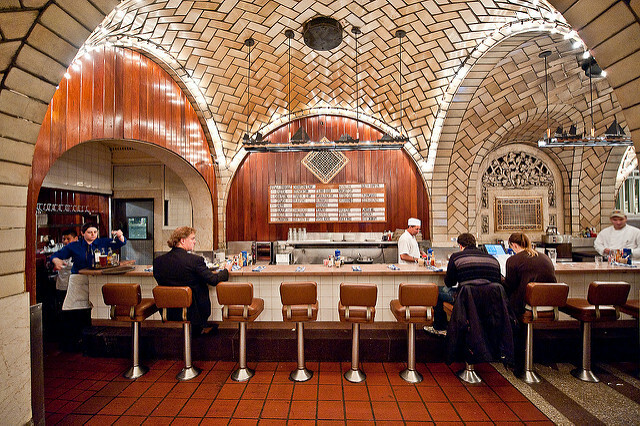 In Michelin parlance, the Grand Central Oyster Bar is worth a detour. If you’re passing through Manhattan, don’t miss it.